The 4 years old Yelp, which is a local review site, has already reached a hefty popularity on Web. Today we have read online the site claims to have more than 8M unique visitors per month, which can already be called a hugely popular site and all that achieved within 4 years only. Pretty impressive one may say. But the company seems to have raised tons of money in 4 rounds totaling $31M to date. The pre-money valuation was rumored to be in the $200M range, which for a site with almost 10M uniques per month is becoming an industry standard already. The revenues, also rumored, are said to be in the $10M range per year, which was widely criticized on different tech blogs as not enough taking into consideration the site’s already massive reach. Well, we are not quite agreeing with those critics. Take for example Digg and Technorati, both sites are hugely popular and their revenues are not quite impressive either and are perhaps in the Yelp’s annual range. Not even to mention WordPress.org‘s case and their strong NO to a $200M buyout deal last year on little to no revenues, as far as we know. We would guess that just like Digg and Technorati, Yelp will also try to shop itself around and their investors are in fact looking for an acquisition deal with hefty exit price tag rather then building a self-sufficient company taking into consideration the very favorable time for web 2.0 companies in the Valley. Yet, we think $10M per year off 8M unique visitors per month is pretty well done job in monetizing their traffic, for now. Their forth round of funding is said to be in the $15M range and led by DAG Ventures. Yelp says that they will be using the money to expand geographically, add onto their sales team, and establish an office in NYC. With this latest round, DAG joins previous investors Max Levchin who put $1 million back in the summer of 2004, Bessemer Venture Partners with their $5 million round closed in 2005, and Benchmark Capital ($10 million, Q4 2006). The company’s total funding is now $31M. If the rumored pre-money valuation is correct then DAG Ventures seems to have bought only 7.5% for its money. The company is based in San Francisco and was founded back in 2004 from former PayPal early employees. Yelp claims they are relying on “word of mouth marketing” but from what we have seen their site is heavily search engine optimized with several million of indexed pages at Google, which is well done and good after all, but you should refrain from claiming you are all about word of mouth marketing. We have no access to their Google Analytics files where the traffic sources are visible, but we are pretty sure a vast majority of their 8M uniques per month is coming from Google and some of the other top search engines. Other critics of the company’s strategy say that a viable approach to building a company like Yelp would be to prove that your business model works in the cities that you initially target and then replicate that model elsewhere once you have your validation. If you cannot establish a profitable business model in the cities you initially target, expanding your sales force, adding additional offices and replicating your unsuccessful model elsewhere are not viable solutions for developing your company. The local space is very crowded area as it seems. Yelp’s competition includes companies like InsiderPages (acquired by Citysearch), Viewpoints, YellowBot, Google Local, Yahoo Local, JudysBook.com, Rummble, LocoGopher.com, Zvents, Upcoming, Qype, Tipped, GenieTown, YellowPages.com, among others. Yelp is the ultimate city guide that taps into the community’s voice and reveals honest and current insights on local businesses and services on everything from martinis to mechanics. Yelp is just real people, writing real reviews, and that’s the real deal. Yelp is a fun and engaging place for passionate and opinionated influencers to share the experiences they’ve had with local businesses and services. Yelp is the definitive local guide in the San Francisco Bay Area and a force to be reckoned with in Chicago, New York, Boston, Los Angeles and Seattle. But really, we’re everywhere. From Austin to Madison and everywhere in between, reviews are coming in from all over the country! Yelp is word of mouth marketing – amplified. Savvy local marketers now have a great channel to effectively target local consumers. Since July 2004, co-founders Jeremy Stoppelman (CEO) and Russel Simmons (CTO) and their Yelp crew have been striving to make life better for people who love to patronize great local businesses. Discovering accurate information on local establishments has never been this entertaining. Writing reviews has never been this fun, easy and addictive! Jeremy co-founded Yelp Inc. in July 2004 with former colleague and friend Russel Simmons. Prior to Yelp, Jeremy was the VP of engineering at PayPal. He left PayPal in the summer of 2003 to attend the Harvard Business School. Upon completing his first year at HBS, Jeremy joined an incubator started by Max Levchin (co-founder of PayPal) for a summer internship. It was there that he was reunited with his old colleague Russel Simmons and the two teamed up to create a vibrant community around local information. Jeremy holds a B.S. in computer engineering from the University of Illinois. Russ co-founded Yelp Inc. in July 2004 with former colleague and friend Jeremy Stoppelman. Prior to Yelp, Russ was one of the early employees and the lead software architect at PayPal. He led a team of top engineers on critical projects related to security, scalability, stability, and internationalization as the company scaled rapidly. Following his time at PayPal, Russ joined Max Levchin’s (co-founder of PayPal) incubator, where he teamed up with Jeremy. Russ holds a B.S. in computer science from the University of Illinois. Geoff joined the team in November 2005. Prior to Yelp, Geoff spent five years building Web communities at eBay, most recently as director of international category management and previously as director of collectibles. His previous experience includes business development and marketing management roles at Excite@Home, Voter.com, Classifieds2000 and Mercer Management Consulting. Geoff has a B.S. in mechanical engineering from Stanford University. Chinese web 2.0 market is hot up to the point where large-scale financial institution like Lehman Brothers has jumped on a travel start-up. Qunar.com is an online travel search engine that we’ve just found out it has raised $10M in its 2nd round a couple of months ago. The investment in the company was led by Lehman Brothers Private Equity and was joined by return backers GSR Ventures and Mayfield Fund. The company is based in Beijing, China and was launched in 2005 and means “where are you going?” in Mandarin Chinese. 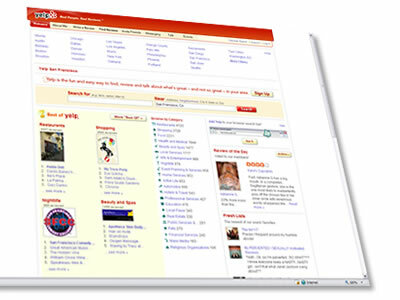 The company was founded by Douglas Khoo, CC Zhuang, and Fritz Demopoulos who had founded and sold the CSEEK search engine to News Corporation and founded and sold the Shawei.com portal to The Tom Group. Essentially Qunar provides a price comparison engine that leads users to transactions. Qunar makes most of its income from advertising fees. That concept and business model is not something new on Internet but is perhaps in its infancy in the huge Chinese market and Qunar is trying to tap into it. Qunar is said that it expects to break even consistently in 2008 and it may seek an IPO listing in 2010 or 2011, either in Hong Kong or on the Nasdaq in US. As from what we were able to dig up Qunar competes with Ctrip and eLong, but analysts predict that it will grow 40%-50% year-over-year for the next couple of years. Qunar has been developing partnerships to get into the Japanese and Korean markets. Under no doubt the major global players on the online travel market are companies like Expedia.com, Hotwire.com, Orbitz.com, Priceline.com, Travelocity.com, TripAdvisor, Kayak, Mobissimo, among others. Qunar.com was founded in early 2005 by three entrepreneurs with a number of years experience operating exclusively in the Asian region – Fritz Demopoulos, Douglas Khoo, and CC Zhuang. With a technology and product development team based in Beijing and directly located next to Beijing University and Tsinghua University, Qunar.com has developed its own proprietary multi-language price comparison search engine in conjunction with these leading institutions. Qunar.com represents a significant step in the development of the constantly changing, albeit rapidly growing online travel industry within the region. For the first time, through Qunar.com consumers can quickly, easily and in real-time compare virtually all available prices for air tickets, hotels, car rentals and tour packages. In other words, Qunar.com allows consumers to get the best choices and value. Qunar.com is the market leader in Asia, and we look forward to meeting the needs of the fast growing travel industry. Currently, Qunar.com searches almost 400 Chinese-language travel web sites. These search results provide our consumers with real-time pricing information and other descriptive details from more than 100 airlines and 10,000 hotels servicing mainland China. As the recognized “new star” in the online travel industry, Qunar.com will continue to provide outstanding service and dramatically change the way consumers search and purchase travel services. Frederick “Fritz” Demopoulos has been involved in the Chinese media, internet and wireless industries for over seven years. He is currently a co-founder of Qunar.com. In addition to these current entrepreneurial business activities, Fritz has been an advisor to an array of well-known Chinese and international media companies including Titan Sports, Hai Run Media Group and InterActive Corp. Previously, Fritz was also interim head of business development at Netease.com. He joined Netease in 2001, and was part of the management team that oversaw a period of significant growth for the company, which eventually became the NASDAQ’s best performing equity in 2002. In 1999 Fritz co-founded and became CEO of Shawei.com. Financially backed by Intel Capital, Softbank and IDG, Shawei grew to become China’s largest sports internet portal. Shawei was subsequently acquired by Hutchison Whampoa affiliate The TOM Group in 2000. Fritz began his career in China in 1997 as Business Development Manager for The News Corporation Limited. He was actively involved in a range of initiatives with various News Corp-affiliated companies including ChinaByte.com, STAR TV, NDS and Twentieth Century Fox. A native of Los Angeles, Fritz was educated at UCLA, The Chinese University of Hong Kong, Karls-Ruprecht University and Cal State Fullerton. He is an avid golfer, tennis player and supporter of the Arsenal Gunners of the English Premier League. Zhuang Chenchao “CC” is a recognized expert in internet technologies. He is currently a co-founder of Qunar.com and leads the company’s technology and product development. Prior to Qunar, CC was a member of the Systems Architecture team at the World Bank and was based in Washington DC. At the World Bank he was instrumental in developing a 130-country, 25-language intranet that was awarded “Best Intranet” by Nielsen Norman in 2003. Prior to relocating to Washington, CC was a founding employee and CTO of Shawei, China’s leading sports portal which was acquired by The Tom Group in 2000. In 1998 while still at university, he also co-founded Shanghai Wei Bo Technologies, a first generation text search engine. Shanghai Wei Bo secured early stage investment from IDG, and the company was eventually acquired by ChinaByte, an affiliate of The News Corporation. A native of Shanghai, CC was educated at Beijing University where he received a degree in Electrical Engineering. Among other pursuits, CC enjoys developing mathematical trading models and investing in the stock market. Douglas Khoo has been involved in both the interactive and traditional advertising and marketing communications business for almost 20 years. He is currently a co-founder of Qunar.com and leads the company’s sales, marketing and business development activities. In addition to Qunar, Douglas is also a co-founder and investor in a range of online marketing service firms, including online advertising agency OneXeno and search engine optimization (SEO) firm Pixel Direct. Douglas is also Asia Director of Unicast, an internet advertising company specializing in rich media that was recently acquired by Viewpoint. Prior to these activities Douglas was a co-founder and Director of Shawei.com. Before pursuing these entrepreneurial opportunities, Douglas had a number of senior management positions during a 15-year career with the WPP group of companies, including Ogilvy & Mather, J. Walter Thompson, M-Digital and Mindshare. Notably he was responsible for Asia for building M-Digital, the online media buying and planning arm of WPP. Additionally, Douglas was GM of China for Mindshare. At WPP he was assigned to work in China, Hong Kong, Malaysia, Singapore and Indonesia. A native of Malaysia, Douglas earned a diploma in architecture from Jaya Institute of Technology. In his spare time Douglas is an enthusiastic golfer and traveler, and an avid reader of Booker Prize winners.